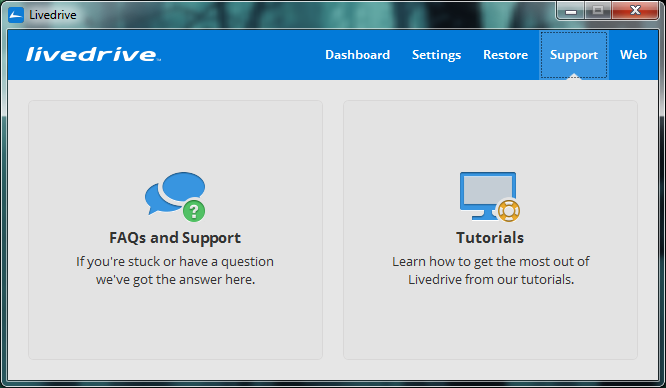 If you're curious how to use the software, you can visit http://www.livedrive.com/tutorials/ to see a demo! 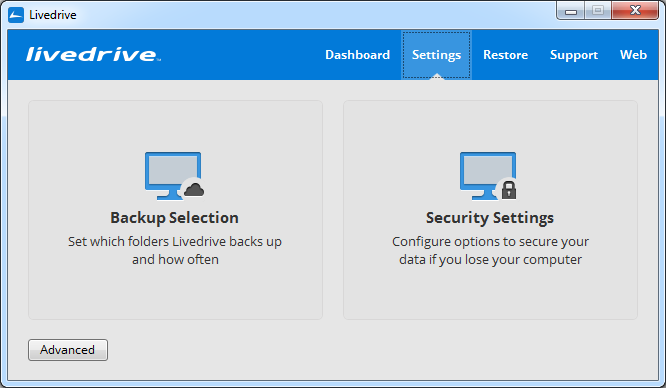 The first time you log into Livedrive on your device you will be presented with the Welcome Wizard, which will run through your first backup. From this point on you will automatically login in every time it is opened unless you’ve specify for a password request in each login instance on the Security Settings portion of the client. The tray menu has been changed to reflect the changes that have occurred in the client. When logged out you can right-click on the tray icon, and this will bring up the tray menu. If you are already logged on the tray menu will appear differently and provide you with more options. Once you have logged in you will be taken to the Dashboard within the Control Centre. The ‘Control Centre’ houses most of the settings and features that were spread across different areas in previous versions. The Dashboard acts as an information centre for you and provides you with summaries on the current status of your Backups, Briefcase and account details. It contains three main elements; a Message Bar, a Backup Dashboard and a Briefcase Dashboard. The Dashboard Message Bar displays different icons and text according to the status of the account software. These are always visible when you are on the Dashboard section of the Control Panel. The Control Centre also enables you to initiate a scan of your backed up your files directly from the Backup Dashboard. 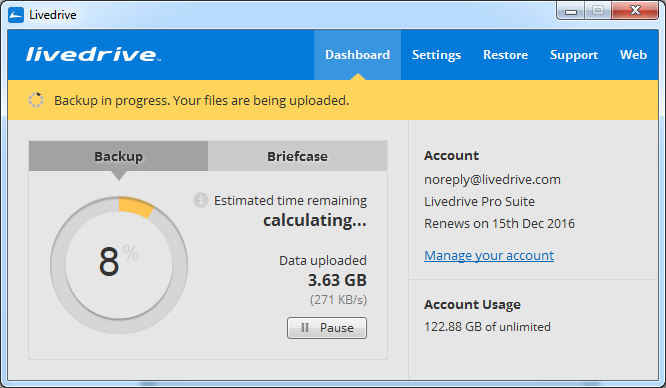 When this option is accessed Livedrive calculates the size of the files for backup and provides a real time update of estimated time to completion. 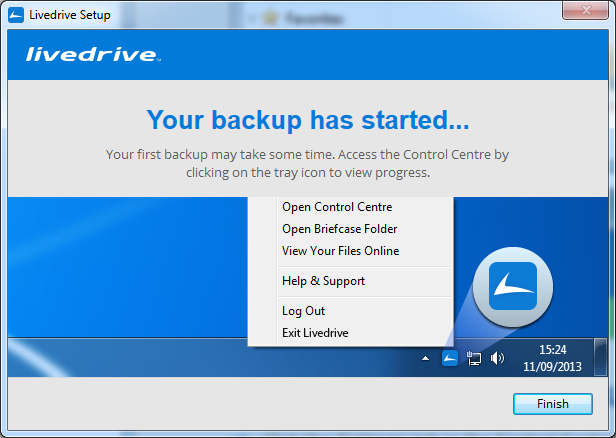 Once you have begun to back up your files and folders the Backup Dashboard displays the percentage total of the backup completed via a constantly updating circular progress bar that provides an accurate estimate of the remaining length of your backup. 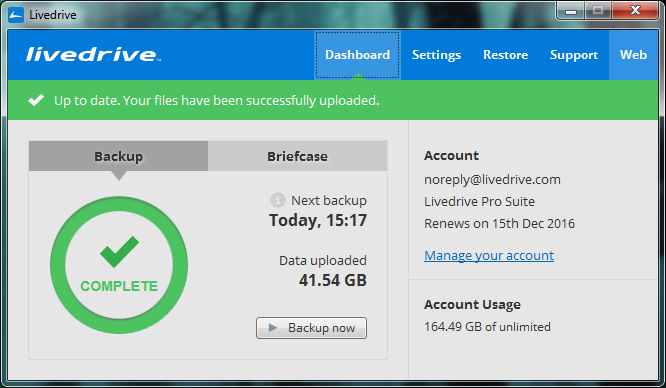 After the backup has been completed the Backup Dashboard will show the time of the next scheduled backup along with the exact amount of data uploaded. 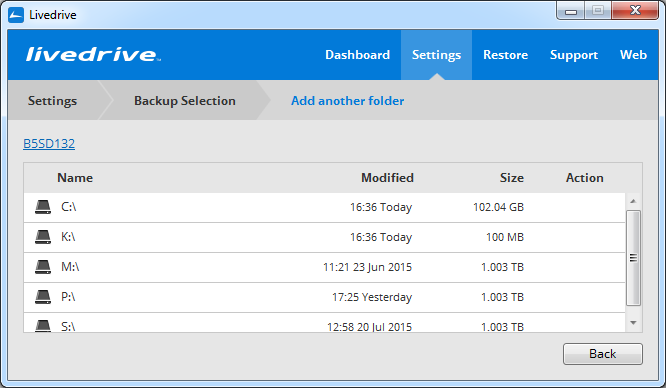 The Backup Dashboard will also scan for new files and folders to add to your cloud. 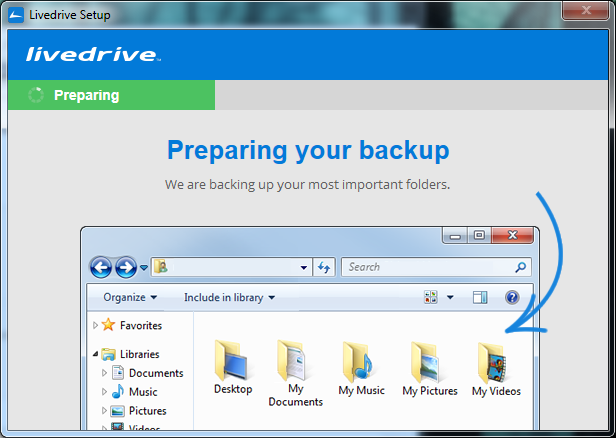 During a backup, whilst new files and folders are being located, the Backup Dashboard will display the message ‘Scanning’. If the client cannot detect an internet connection or if the transfer rate falls to zero for more than 15 seconds, the display will inform you that you are currently offline and your files cannot backed up. This option on the Dashboard allows users to access the Briefcase folder directly through the Control Centre and provides you with an up to date view of your uploads and downloads. If you have not yet added any files or folders to their Briefcase, the display will inform you of the benefits of the Briefcase and how you can learn more. 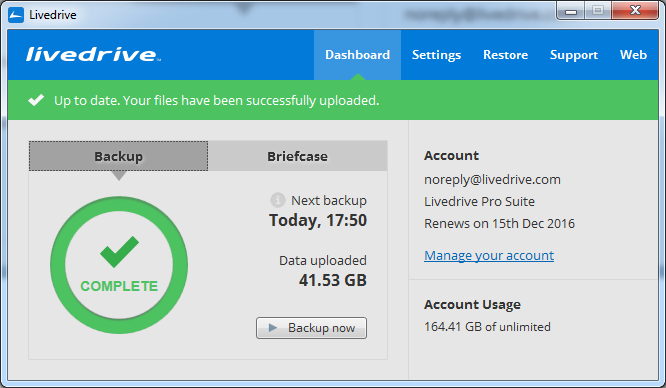 Once Livedrive begins to sync files and folders to your Briefcase, the upload and download icons and up to date texts will change to provide you with information on how many files the Briefcase are uploading/downloading. This option on the Control Panel gives you access to three different settings categories - Backup Selection, Security Settings and Advanced Settings. 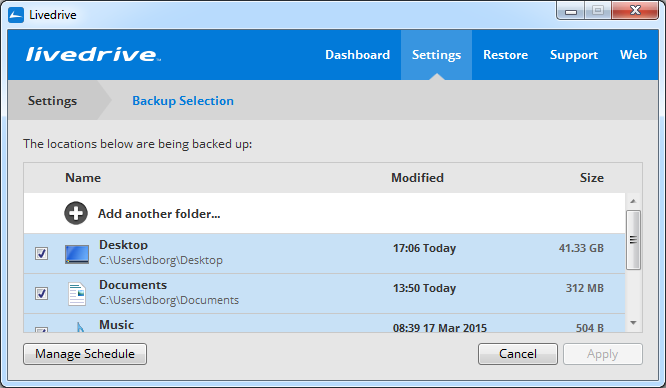 Backup Selection allows you to do three specific actions; view which folders are currently being backed up, add any new folders that you would like to back up, and view and change the backup schedule. 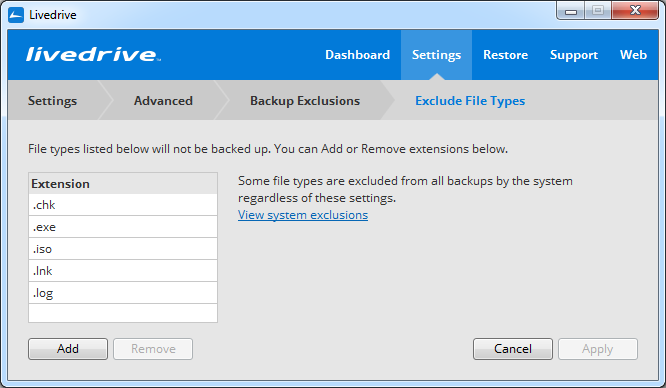 Backup Selection allows you to add or remove any folders on your computer by simply clicking the checkbox next to the folder name to select or deselect the folder in question or using the add another folder button. When you choose to add a folder you are directed to another screen on the client that allows you to navigate through your system from top level volumes and drives and select which of these you want to backup. 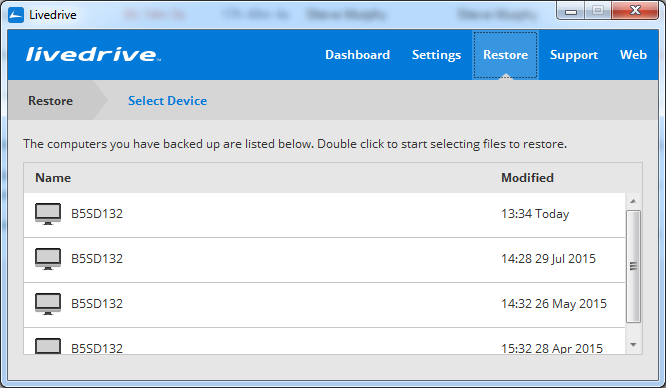 You can add folders to your backup by clicking on the Add button. If you decide to remove a folder from the backup, once the checkbox is de-selected the background colour of the bar will change colour to red and after you confirm you want this removed the folder bar will disappear from the table. If a folder has been renamed since the last time you accessed the client, the folder row will show a pink background and you user will be prompted to uncheck and remove this. Once this is done you user can then add the folder again under its recent title. NAS drives cannot be added to scheduled backups unless you have purchased an add-on for these drives. If you try to perform this action an error box will inform you that you need to get the necessary subscription for this. 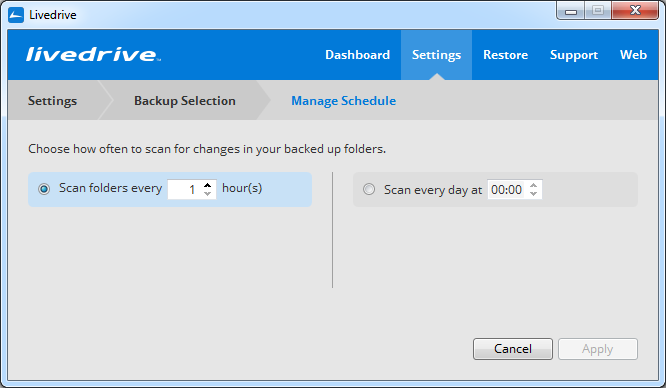 This option allows you to manage the frequency of back ups. 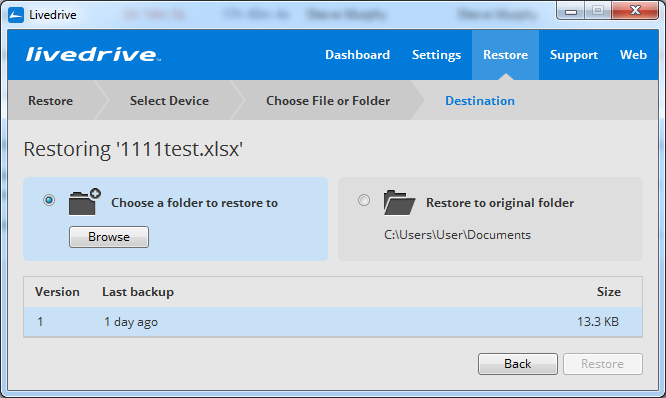 You can set a backup interval period along with the time of day this backup should occur. Real-time backup is no longer supported in this version. Therefore, after you upgrade from a previous version your backup schedule will be set to 1 hour. The majority of clients’ settings are now housed under their specific branches on Advanced Settings apart from Security Settings, which are now part of the top level of settings. 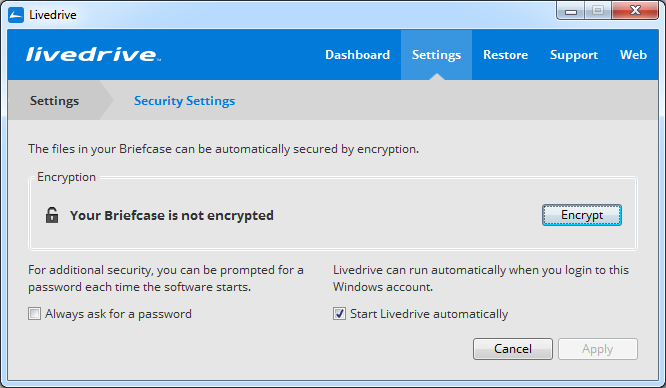 Security Settings provide three features; providing you with the option of encrypting the contents of your Briefcase, providing you with the option of having the client prompt you for a password each time you attempt to start up the client, and providing you with the option of having Livedrive run automatically when you log in to Windows. However if the Briefcase is disabled Security Settings will only allow you to change whether you require a password prompt upon login or choose whether Livedrive starts automatically. The Advanced Settings within the Control Centre contains all the settings that would be of interest to advanced users. This no longer includes the Security option, as this has been moved to the top level Security screen on the control panel. The Advanced settings have been slightly modified from the previous version as, ‘Online Files’ now reads as ‘Briefcase Files’. You can navigate into any of these screens by simply clicking on any of the icons. The specific settings have also been changed to give you a better and smoother experience. 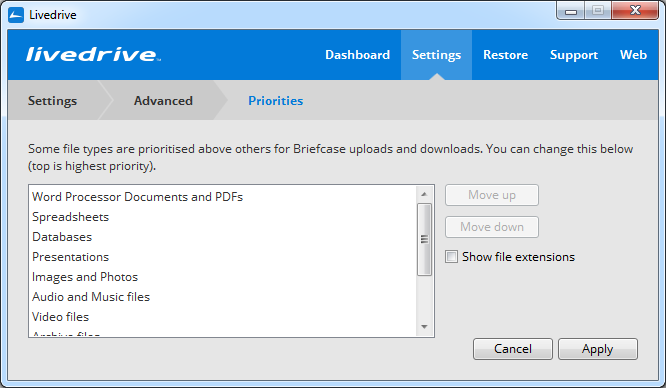 The Priorities setting allows you to set which files you want the Briefcase to prioritise for uploading or downloading. This is a handy feature that ensures your most important files are constantly synced with the cloud. 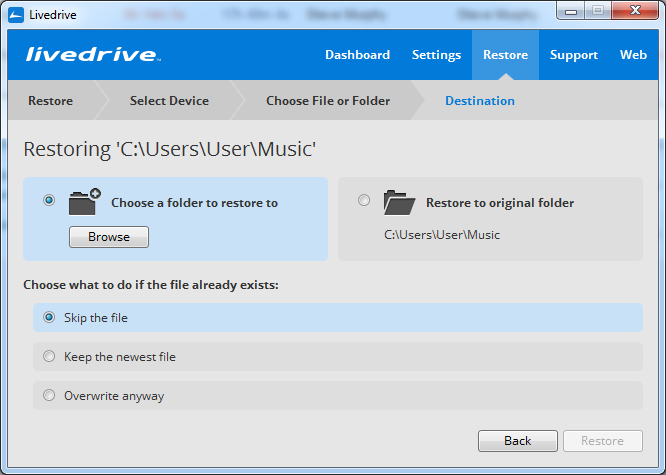 For example if Livedrive is used for both personal and work files you can prioritise file types such as word and excel over music and video file types to ensure your work documents are constantly being updated. 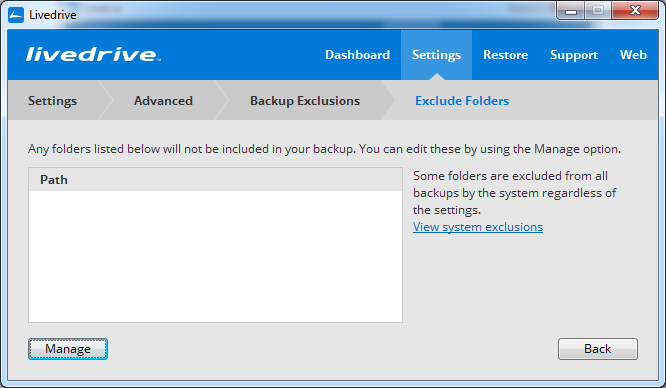 Backup Exclusions allow you to choose which file types or folders you do not want backed up on Livedrive. 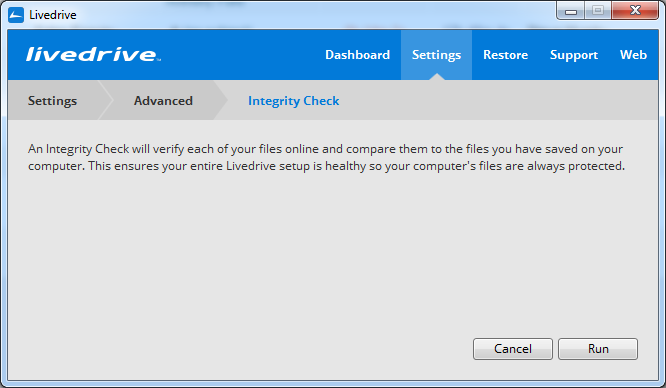 From here you can either select specific file types such as ‘.exe’ and ‘.iso’ file types, or specific folders. 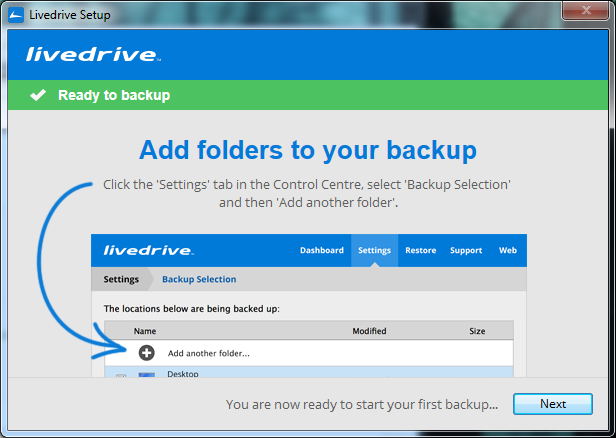 You can also view online the system folders and file types that Livedrive does not back up such as temporary, system and browser file types. 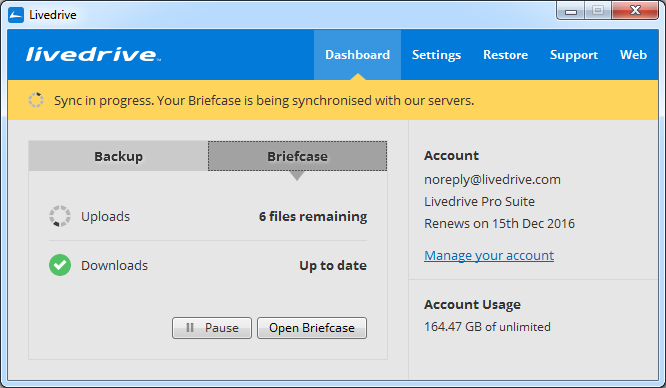 You can use LAN transfers to automatically sync all files in you Briefcase to other computers currently over your LAN that also have the Livedrive software installed. 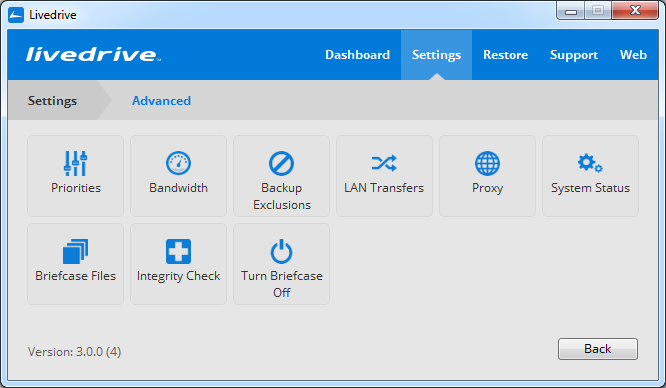 You can check or uncheck the tick boxes to select if you want to activate/de-activate LAN transfers and then to select which of the devices on the network you want to share their Briefcase files with. 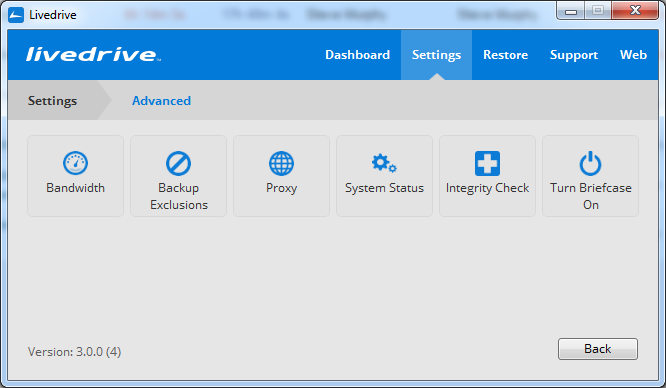 The Proxy setting allows you to access Livedrive through a web proxy. You can configure your proxy either through a SOCKS protocol or a Web Proxy. 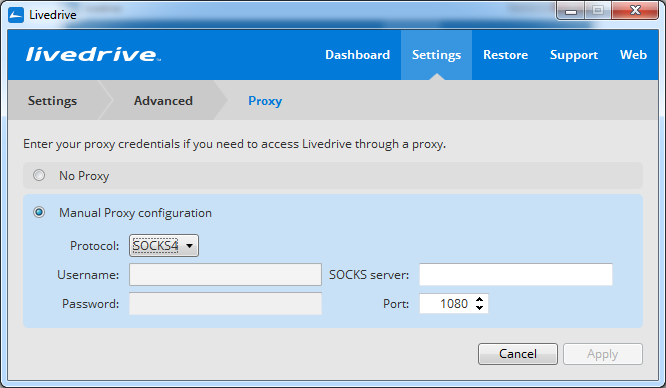 If you choose Web Proxy the SOCKS server field changes to an IP Address text field. 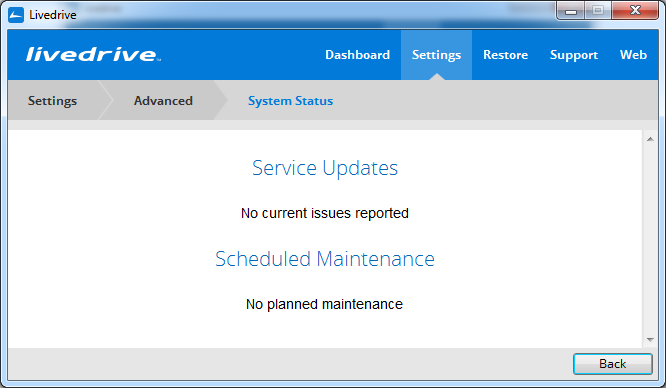 The System Status setting provides you with information on any issues that may be currently affecting Livedrive. 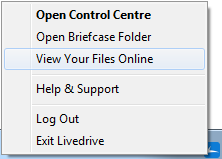 You can now view and manage your online files under the Briefcase Files setting. These options were housed under Online Files in the previous version. 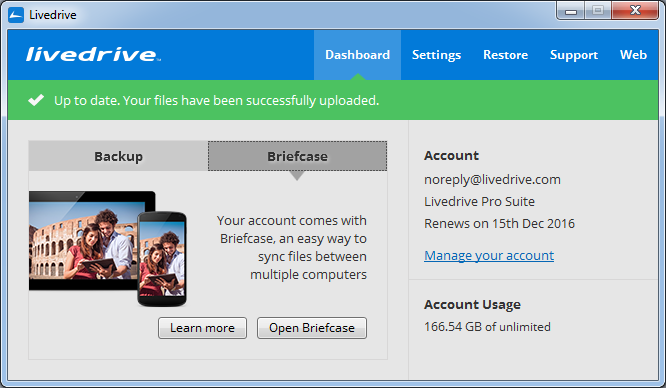 You can configure how Livedrive handles files that other devices have added to the Briefcase, along with how these files that are currently stored on the cloud should be opened. If you choose to have all files on the Briefcase downloaded to your computer, you can add exceptions to this. 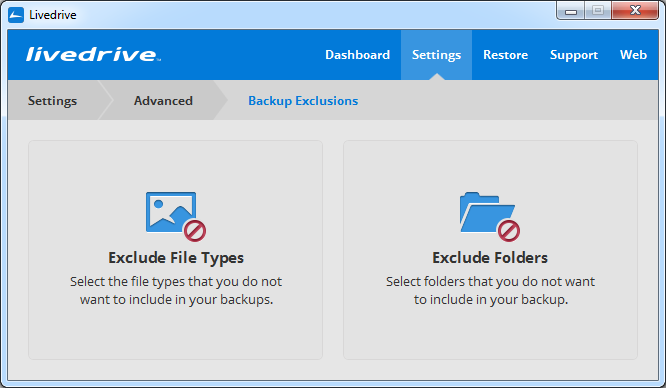 For example if you have videos and documents stored on the Briefcase in the cloud you can choose to exclude multimedia file extensions and/or limit the maximum size file that can be downloaded. However if you do not want files to be automatically downloaded to your computer you can choose to just store files on the cloud. 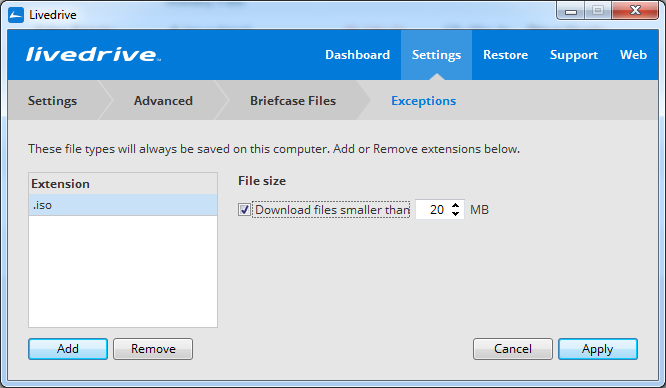 If you do want certain files to be saved on your computer you can add exceptions to this by adding file extensions or choosing to download files smaller than a certain size. 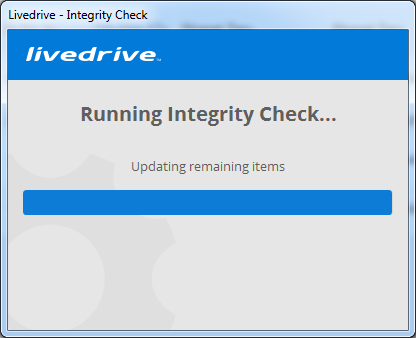 Integrity Check allows you to run a health check on your computer. This checks your files and folders are correctly synced to the cloud. When you run an Integrity Check the client will compare the files on your system to those on the cloud to ensure they are synced correctly. 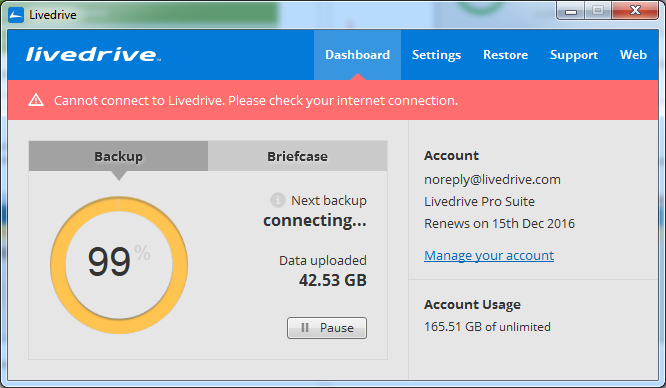 Once this is complete, Livedrive will update any files that are not protected in the background. 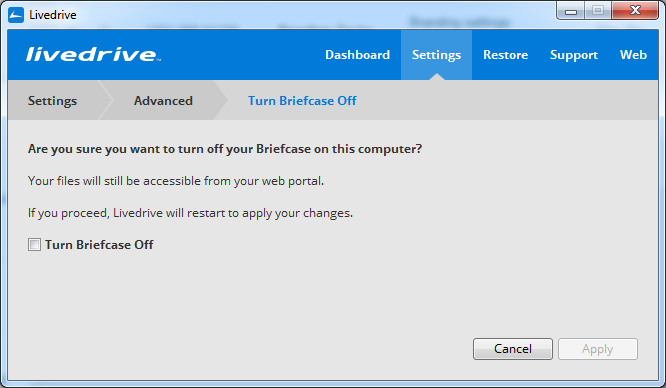 You can choose to turn off their Briefcase on your system if you only wish to access your files from the web portal. 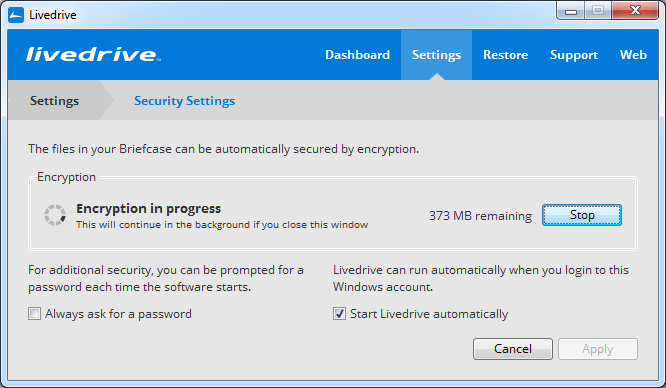 This action will restart Livedrive and you will no longer be able to access Encryption, Priorities, LAN Transfers and Briefcase Files as these are linked to the Briefcase. You can turn your Briefcase feature back on by selecting this on the Briefcase Dashboard or by doing this in Advanced Settings. You can now access a variety of support materials through the client by using the Support tab. These are FAQ’s and Support and Video Tutorials. By clicking on either of these you will be redirected to an external site that either connects to the support section on the Livedrive client or to a playlist section on YouTube with how to videos. The client now has a built-in direct link to your cloud page. 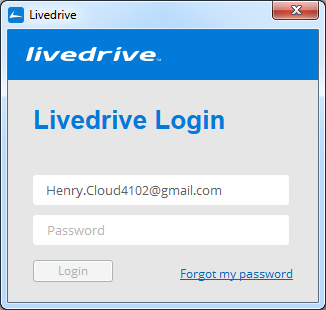 If you click on Web, this will direct you to your relevant cloud page on the Livedrive website. You can also access this via the Tray Menu.